As you all know, I love the shuk (Machane Yehuda Market), and am there multiple times a week, often giving tasting tours, or just going there to hang out. So therefore I notice every single change that takes place there, from the smallest stand closing, to a change in what a stand sells, to a restaurant moving from one location to another. That is why, when I made my map of every stand in Machane Yehuda last year, I specifically sought a way to make it easily updateable. Other maps I’d seen attempted were out of date virtually before the ink was dry on the page (or before the webpage updated). So I labeled the sections of the shuk, and then made a text list to go with it, knowing the stores would change but the streets wouldn’t. That map came out over a year ago, so I realized it was long overdo for an update. And so I recently did a walk-through at the shuk, writing down all of the things that I needed to change. So today I proudly present you with a fully updated map! To my mind, however, more interesting than simply knowing what is in the shuk at any given time is following the gradual growth and changes that take place there. So I wanted to highlight some of the changes between last year’s map and this one. 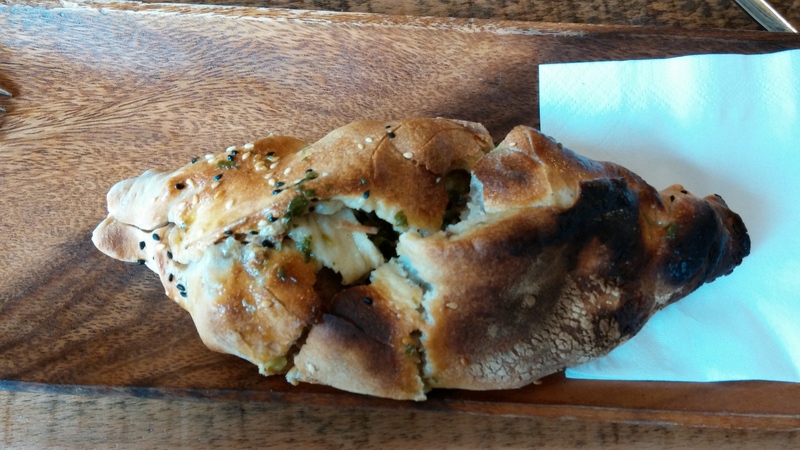 For starters, the two prominent trends that have been taking place in the shuk over the past few years is the opening of many restaurants and of many pubs. That continued this past year. That isn’t to say that every effort succeeded, however. Some restaurants opened and closed between the two versions of the map (there was one like this in section 7, for example). Others, such as the kubbeh place in section 21, tried to change into something else (burgers), but then changed back. And still other locations saw a fairly new restaurant close, and another place open under new management (e.g. Kebabis in 24 and Balah in 3). 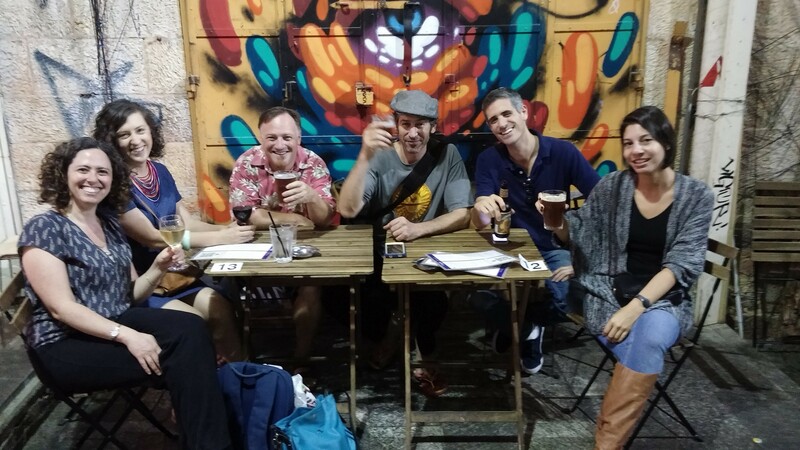 Some friends and I sharing some #BeersAgainstTerror in the shuk at the start of the latest wave of violence. I also want to give a special mention to one other new eatery: Ish Tabach (27). It is not in the shuk itself, but in the area. But it is one of my favorite new food places. They basically just make one thing: a Syrian-Kurdish dish named shamburak, with many different option for the meat filling. Delicious and not expensive, they’ve even gone through an expansion already, creating a new seating area, entered from Section 28. The map now has four more bars on it: Manchis (Section 22 – officially outside the shuk), O’Connel’s (8 – a branch of a bar elsewhere in town), Freddy Lemon (5) and my favorite The Beer Bazaar (5). 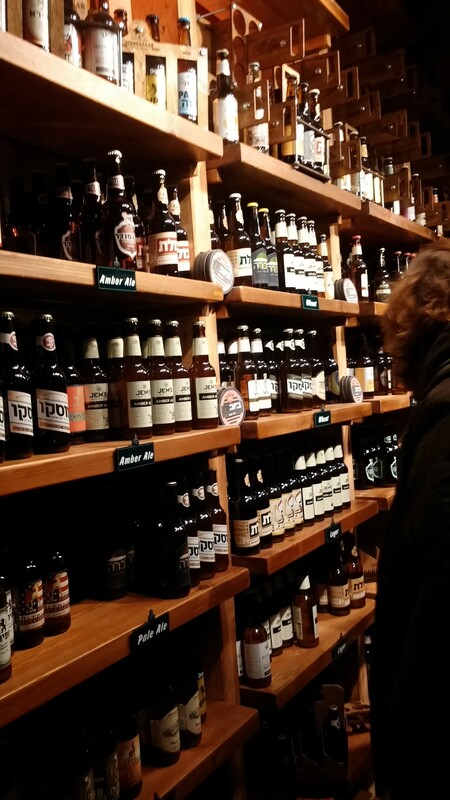 The Beer Bazaar is a branch of place that opened over 2 years ago in Tel Aviv’s Shuk haCarmel, and features only Israeli craft-brewed beers (both as a bar and as a bottle shop to buy for home). 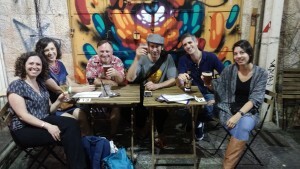 This continues the trend of more businesses flourishing in connection with Israel’s burgeoning craft beer scene. Plus, since this one is in Jerusalem, they have taken care to have a kosher menu as well. At the same time, word is that one of the bars on last year’s map is about to close down — Sirtaki (5), right across the road from Beer Bazaar. One of my standard stops on my tours has always been Mousseline, delicious gourmet French ice cream. They just a few weeks ago moved around the corner from their prior location, so I wanted to let you all know, in case you have trouble finding them. They used to be in Section 24, next door to the awesome Georgian place Hatchepuria. Now they are in Section 26, next to Fortuna. Other eateries or shops have remained open, but have done major (and lovely) renovations to try to attract more customers. These include Yehudit (26), B’Mordoch (25), Abu Daud (6) and Cafe Mizrachi (17). Mizrachi is notable as it was the first cafe to open in the shuk, and has gone through a few different phases over its storied history. But it remains open, even after all these years. 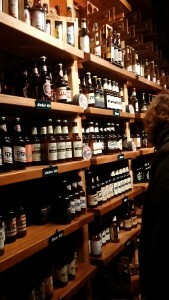 It is worth noting that the trend away from produce stands and the like is not exclusive. At least three new (albeit small) produce stands have opened (3, 8 and 14), two of which replaced stands that sold non-food items previously. And that follows on the heels of at least one other decent-sized produce stand that opened with the two previous years. So while some people complain that the shuk is losing its character, I maintain that the shuk will always remain a fresh food market, at its core. Finally, I want to talk about what’s been going in the market during the current wave of Palestinian violence. At the beginning, the market was completely empty, though this was no different than anywhere else around the country. In general, people were staying in and avoiding going out. But the feeling of emptiness in the shuk was exacerbated by the fact that the violence began right as the major tourist season was ending, so a large part of the drop was natural anyway. Compound this with the start of cold weather, and that made it seem completely empty. As the past few months have rolled on, people have returned to their normal routines. Additionally, people have realized that there have not been any attacks in the shuk (and God-willing there won’t be, despite one incompetent attempt nearby), there is a strong security presence there, and most of the attacks have shifted out of the major cities into the West Bank. So the shuk has largely returned to normal. Furthermore, a number of us have made an effort to go out and spend money in restaurants, bars and stores following terror attacks, just so the businesses don’t hurt too badly. There are even organized attempts: the Eatifada group on Facebook, and my friends and my (only slightly tongue-in-cheek) hashtag campaign #BeersAgainstTerror. I’m happy to say that through this entire time, I’ve seen no significant drop-off in requests from tourists for my shuk tours. And I hope it continues as such. If you’re interested in one (or in any otehr tours), please get in touch!